Every two years, we get the Olympics. And when that happens, we get a tornado of patriotism, new national heroes, incredibly good-looking humans in very small amounts of spandex — oh, and a new crew of baby names inspired by the Olympic games. We definitely get a lot of those, because if you're a parent who's into sports who would maybe like to raise a child who is also into sports... well, you can't really do much better than the Olympics, can you? Baby name trends, at least in the United States, are fascinating in their reflection of the cultural and political atmosphere. The latest economic recession, for example, coincided with the rise of "new" names and spellings that are now, idiosyncratically, American (think Jaxon and Kiranda, for example). As the economy slowly recovered, more elegant, "classic" names arose in what seemed like a direct response: Names like Charlotte, Olivia, and Sophia have been topping baby charts for the past three years, according to the Social Security Administration's data on popular baby names in the United States. There are names that are almost immediately dated — Cheyenne and Madison, for example, are '90s babies, while Brayden is mid-aughts. 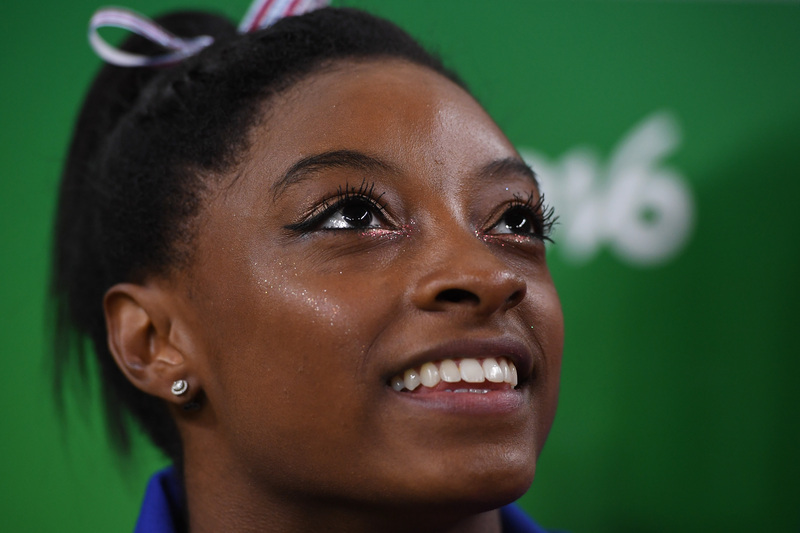 In a few decades, will we be saying, "Simone — the 2010s. Duh"? Probably. And I'm not complaining. It's a beautiful name with some beautiful humans associated with it. But what other names will be gracing the baby boards over the next few years? It's not like there's a lack of super-humans to be inspired by. Just take a look at these 11 monikers drawn from some of the spectacular competitors in the Rio Games. I mean... duh. Not only is the name "Simone" shared by two incredible, groundbreaking athletes (S imone Biles and Simone Manuel), the French moniker has a timeless elegance and sophistication that just about anyone would want that for their child. Baby name enthusiasts are already predicting a huge jump in Simone's popularity, which currently sits at number 21 in the United States according to the SSA. Ashton Eaton is an Olympic champion decathlete and world champion heptathlete — which I admittedly did not know was a sport until about 10 minutes ago, but now that I know it is, I also know that it means you're good at pretty much everything. "Ashton," on the other hand, is a British name meaning "from the town of Ash trees." Which... OK. Ashton is still a strong, slightly posh, gender neutral name, though, and that's rad. Dipa Karmakar is the first female gymnast ever to compete for India in the Olympics, and first Indian representative in the sport in 52 years. Oh, and she made it to the vault finals, which means she's among the top eight in the world. "Dipa," fittingly, means "lamp" or "radiant," as Dipa is lighting the way for a new generation of Indian gymnasts. Yaaaas, Aliya Mustafina — a two-time Olympic gold medalist in uneven bars, she who once said, "I have no idols and never have" when asked who she looked up to in gymnastics. I love her. "Aliya" is Hebrew for "ascending," which is appropriate for a high-flying gymnast. Ugh, Danell Leyva. Handsome Cuban-American gymnast. Like, so handsome. And talented. And a self-proclaimed feminist. And has a habit of sitting under his "special towel," thus causing Leslie Jones to aptly describe him as Linus (which, in turn, caused Danell to turn full fan boi). Danell is a variation of "Daniel," a Hebrew name meaning "God is my judge." Ibtihaj Muhammad, a fencer, is the first Muslim-American woman to compete for Team USA while wearing a hijab. Not only is Ibtihaj now an Olympic medal winner (the women's team walked with the bronze), she has also launched a clothing line, Louella, with her sister, Faiza. Ibtihaj means "joy" in Arabic, and that seems just about perfect for this athlete. Li lly King talks the talk and walks the walk. She is named after a delicate flower, but gives soundbites like, "I'm not that sweet little girl. That's not who I am." Galen Rupp is a super-distance runner (he's competing in both the 10,000 meters and the marathon in Rio, which is incredibly impressive). Galen is a Greek name meaning, "calm," and I kind of love it. When you say it enough times, it kind of chills you out. Also, it's gender neutral. That's cool. Jordan Burroughs, the American wrestler, has @alliseeisgold as a Twitter handle. This is very much OK, considering he's a three-time world champion and defending Olympic champion in freestyle wrestling. Jordan, despite its '90s vibe, is an ancient name that was given to people who had been baptized in the Jordan river, located in what is now Palestine. Nathan Adrian is my number one swimmer boi crush. Look at him! Nathan is Hebrew for "given," and I would say, yes, Nathan has been "given" as a true gift to humans.